Can we please discuss the amazingness of this cocktail... I mean really, how can you not make this on the 4th?!? I will be sipping this cocktail and pretending Bobby Flay made it for me, not only made it for me- but is sitting next to me enjoying it as well! Bobby Flay, I love you! 1.In a small saucepan, bring the water to a simmer with the sugar and stir over moderate heat until the sugar is dissolved, about 1 minute; let the sugar syrup cool. 2.In a blender, puree the watermelon until smooth. Set a fine-mesh strainer over a bowl and strain the watermelon juice, pressing gently on the solids to extract as much juice as possible. Discard the pulp. 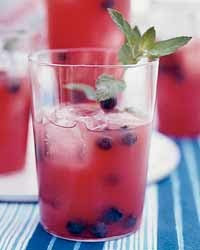 3.In a large pitcher, combine the sugar syrup with the lime juice, blueberries and mint leaves. Using a wooden spoon, lightly muddle the blueberries and mint. Add the watermelon juice and tequila. Refrigerate until chilled, about 2 hours. 4.Pour the cocktail into tall ice-filled glasses. Garnish with the mint sprigs and serve. Courtesy of Food & Wine AND my chef CRUSH... Bobby Flay! i also love love love bobby flay. i have to avoid the food network so my hormones wont go into overdrive :) the cocktail sounds delish. Thank you so much for the HUGE compliment of sharing my little post! Just saw that you became a follower on my 'lil blog. Mostly I saw your graphic, and I'm a sucker for cuteness! HOLY CUTENESS BATEMAN! I'm adoring all that I see so far. I hate to admit that I don't follow EVERYONE back, 'cause I'm picky and mean like that. But right back at 'cha...cause this is really cute! Jess- you are too funny. I will come and sit with you and Bobby and have one anytime! Um, yum! Gorgeous cocktail too! I saw a really cute cocktail in Food Network magazine with a blue pop rocks rimmed glass (red, white & blue) it would look great with this drink too!